I put all the interesting kimono up on flickr in their own set. So you should be able to click on that and go through the slide show and hit the 'i' button and get information on each one. If you have questions, feel free to comment on the photo or just comment here, and I'll do my best. 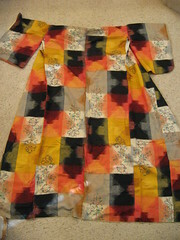 There's a few less interesting kimono I have, too, but I'd forgotten I had a very plain quilted one that I love to pieces. Literally. I have to resew the shoulder seams, I think, and it'll be useable again this winter. Happy me. But you gotta click to get more of the details, as most of these have an accompanying detail photo, too. Click any picture and it'll take you to the picture and you can click on the set to the right. The cloth is made by dyeing the thread, first, and THEN weaving it. In order... gah, it makes my head hurt to think of it. So, no, the picture isn't fuzzy, it's just that the threads don't line up perfectly. So it's all the more unique for it. 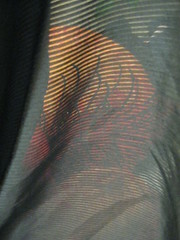 The sheerness of the one black men's haori, you can see a chrysanthumum design through it. I like the chrysanthemum one a lot. Some of the patters are amazing in their detail. Yeah, I love the chrysanthemum one a lot. I still have to figure out what to *do* with it as the material is very sheer, and I want to keep that whole bottom border together as one piece. Might use it as a bottom border for a black jacket or something. Yeah, in the pictures it makes me dizzy too, in real-life, it's better. Whew. whee, I shall take your word. As I spammed your LJ today. These are so very lovely! Have to admit, I'm actually kind of (more like a LOT) jealous of you... But thanks so much for thaking those pictures. They're very, very pretty. I'm very glad you like them! It was relatively cheap as part of an odd-lots bundle... there were four of us and we split a regular sized bundle more than ten years ago. The whole thing was rather expensive, but a quarter was affordable, and now when I wander through kimono shops on-line, I can kinda see I did pretty well. Mmm... neat. I wish it were wearable, rather than me having to figure out what to do with it. *laughs* But it is very beautiful. Those are very cool! 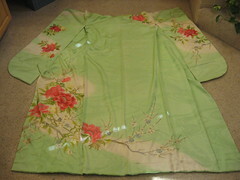 I love looking at kimono pictures, they give me lots of design ideas. The whole ones I'm mending shoulder/sleeve seams as I can. The ones I like wearing are mostly the Haori, which are in pretty good shape, all in all. *beams* They're fun to bring out... and it was cool to have the opportunity to take pictures of them. Glad you like them!